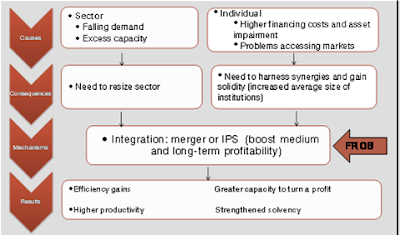 The momentum in both these areas – at the sector level, with the need to resize and recapitalise, and at the individual level, with the need to take advantage of synergies – has combined to create the ideal environment for the merger activity seen among the savings banks in the past year. In turn, the high growth of past years, fuelled by the concentration of transactions on the real estate sector, had altered somewhat the traditional balance between the assets and liabilities sides of the balance sheet, generating a high level of reliance on the debt markets which, at a time of widespread growth in uncertainty, made liquidity management particularly challenging. In addition, there were the intrinsic constraints on the savings banks preventing them from generating core capital by any means other than capitalisation of profits, as the doubts as to how attractive the cuotas participativas (non-voting equity units), the only instrument available to them, may be to investors have hindered their development. These factors painted an adverse scenario for the savings banks in particular, making it advisable to undertake a large-scale transformation of their structure. This has taken the form of corporate moves, aimed at gaining solidity and raising efficiency, as an essential condition in order to enhance not only the savings banks’ competitive position but also their market credibility, increasing the average size of the institutions or groups and harnessing synergies.